Empty capsules allow you to fill your own powders at desired potencies, and avoid tablet binders and fillers. Buying powdered vitamins and filling your own capsules can save up to 50% off most retail prices. 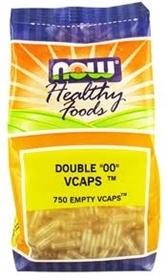 Our Vcaps "00", depending on the powder, can hold between 546 - 1092 mg.